If you came here from Twitter, | India, Ink. India, Ink., has moved. The live version of this page is now located at http://ink.indiamos.com/if-you-came-here-from-twitter/. Sorry for the inconvenience! India Amos has been art director at Nextbook [now Tablet magazine], a senior designer at St. Martin’s Press [where I designed book interiors solely for Tor/Forge Books] and Neuwirth & Associates, and managing editor of Seven Stories Press and PEN America , the literary journal of PEN American Center. From 1999 to 2001 she was webmaster of poets.org, the website of the Academy of American Poets, and for the three preceding years she was a program associate at the same organization, administering poetry awards and designing the quarterly journal. From 1994 to 1996, she was a program coordinator at PEN American Center, directing the visiting writers program and administering emergency funds to writers in need. She is production manager of Bloom and a design editor of jubilat , both literary journals. In 2008, she entered the Interactive Telecommunications master’s degree program (ITP) at New York University. I also worked, millions of years ago but still somewhat relevantly, at Tower Books in Sacramento and Seattle, and I spent some time blissfully shelving at my college library. Right now I’m job-free so that I can spend more time at school (or, more accurately, so I can eat and sleep—two activities that had to be dropped from the schedule while I was still at Nextbook and in school), but I occasionally perform freelance editorial work (mostly pro0fread1ng), design, typesetting, and Web stuff. It’s a blog about book-related stuff. Mostly. Making Castoff – as seen on kottke.org! What does an "art director" do? Of course, the best parts of the best pages here are the comments. Leave a comment—today! I’m following you! Will you follow me back? I may already be following you! In a vain attempt at not letting Twitter eat my life, I try to limit the number of people I follow directly. However, I keep up with many additional people through Twitter lists compiled by myself and others, and I track still more through my RSS reader. So if I don’t reciprocate your following me, please be comforted by the knowledge that I may have been stalking you through more stealthy means for weeks, months, or even years. Feel better now? 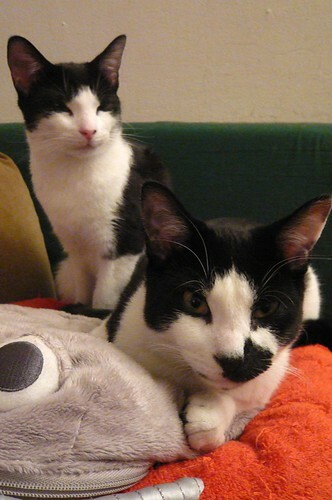 —Ampersand (left) and Interrobang (right), whose misdeeds are catalogued at @catcrimeblotter. Please see the OAQ for answers to this and other Occasionally Asked Questions.